Boston Terrier dog vests from Boston Terrier Gifts. Dog Vests are practical dog clothes for your Boston Terrier. A dog vest will protect your Boston from bad weather and keep them warm and dry. Some dog vests come with a hood, some with a harness and some are for the working Boston Terrier. Special dog vests also make great outfits for the holidays. 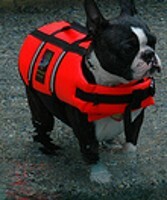 Dog vests are a convienant and economical way to protect your special Boston Terrier dog. Click on the pictures below to see a larger picture of that praticular Boston Terrier dog vest. Elegant Christmas harness vest of your choice of plush red or green velvet, trimmed in white lace around the outside and down the back. Features heavy duty hardware closures underneath and in front for maximum security, as well as Ring on back (all of which are reinforced for added strength). Also features a white faux fur collar. Do your Christmas shopping in style! Harness Vest in a Christmas print especially designed to be stylish while helping Mom with the Christmas Shopping. Features adjustable straps with locking hardware on the side of the vest for ease of attaching and secure closure and a bell attached to the "D" ring for spreading holiday cheer! Optional matching leash and tote also available. Your Boston will be right at "Home on the Range" in this complete outfit of vest, bandana and hat. The vest is made from patchwork ultra-suede, trimmed in matching fringe. Includes a coordinating neckerchief and cowboy hat. Vest features hook-and-loop closures. Hat has an adjustable strap for a snug, yet comfortable, fit. Hat is available in your choice of Brown, Black or White. "Home on the Range" for the little lady in this cute 2 piece outfit. Camel-colored micro suede vest decorated with matching fringe. Includes a cowgirl hat decorated with matching camel fringe. Hat is available in your choice of black, brown or white. All colors of hats are trimmed with tan fringe. PROTECT your Boston Terrier at work, play or home with a quality dog vest! Fully lined vest made from our cute cowdog print cotton fabric lined in cotton. Features heavy duty closures underneath and in front for maximum security, as well as 'D' Ring on back (all of which are reinforced for added strength). We carry a matching Tote made of the same material which can be purchased seperately. Fully lined vest made from heavy duty pink with black polka dotted print fabric lined in black cotton. Features heavy duty closures underneath and in front for maximum security, as well as 'D' Ring on back (all of which are reinforced for added strength). Optional tote is designed for the "Chic Mom" to carry when out for a stroll with her best friend. Fully lined vest made from heavy duty blackwith pink polka dotted print fabric lined in black cotton. Features heavy duty closures underneath and in front for maximum security, as well as 'D' Ring on back (all of which are reinforced for added strength). Optional tote is designed for the "Chic Mom" to carry when out for a stroll with her best friend. Great stylish summer days outfit with Blue gingham and beautiful daisies. Fully lined with coordinating cotton/polyester blend fabric. Vest uses hook-and-loop closures for comfortable fit. Complete the outfit with an optional matching hat. Hat sold separately. Animal Print Faux Fur vest and solid black suede bandana. Both Bandana and Vest attach with hook-and-loop fasteners for a secure, comfortable fit. The vests are made from a lightweight machine-washable 100% cotton or a cotton/polyester blend fabric, lined with a coordinating color. They feature hook-and-loop closures on the front for a neat-appearing, comfortable fit. Specify your choice of fabric. Fully lined vest made from stylish blue toile fabric lined in navy cotton. Features heavy duty hardware closures underneath and in front for maximum security, as well as 'D' Ring on back (all of which are reinforced for added strength). Available in your choice of red, black or navy toile. Optional tote is designed for the "Dog Mom" to carry when out for a stroll with her best friend. Sold seperately. Beautiful Happy Halloween Shirt for Lightweight, cool cotton unlined shirt. Fastens in the front with hook-and-loop closures. Bright flourescent orange polyester and cotton blend safety vest utilizing 3M brand safety reflective tape sewn on the sides and front to protect the dog in low-light conditions. Also available in orange mesh.